The Roy S. Yates home at 1710 Edgewater Drive in Orlando. A group of men and women can be seen standing in the yard in front of the home. There are cars in the driveway at right and the road in front of the home is brick. 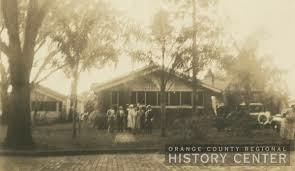 Information on the photograph indicates that this was the first home built on Edgewater Drive (formerly Dixie Avenue). Photo courtesy of the Historical Society of Central Florida, Inc.